No need to go all the way to Napa Valley for good wine. Minnesota has some great wineries in your backyard. Get all the details for this amazing weekend adventure. The Unversity of MN has been developing grapes specifically for our cold climate. This guide helps you determine what grapes to look out for depending on your tastes. Vineyards are closer than you think. 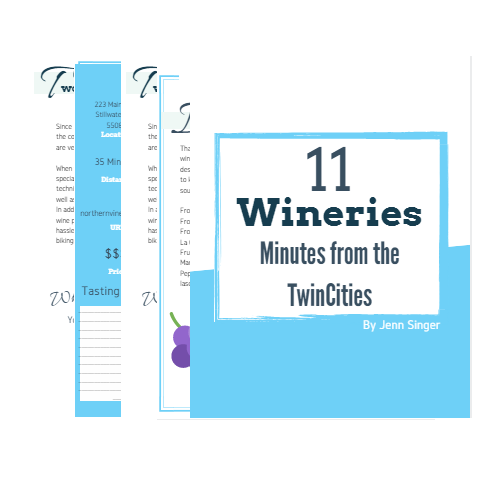 All of the wineries are less than a 60 minute drive from the Minneapolis. Make sure you check out some of the unique events the wineries host, including grape stomps, chocolate tastings and so much more. It goes so much more than just a girls event. Get your guide today and start your weekend off right. You will be receiving an email shortly with instructions on how to download your guide.